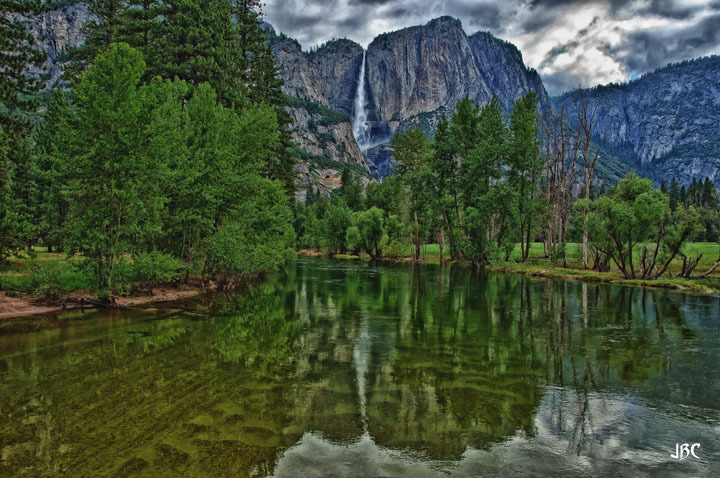 Hi Folks, welcome to one of my favorite parks, Yosemite Valley, probably one of the most magnificent places on Earth. Did you know, well I read this somewhere, that 7 of the tallest waterfalls on the planet can be found cascading or freefalling into the valley. I try to go every early May when the spring thaw is in full melt. There have been years when the valley floor is so flooded, you cannot get into the park. The best time is when the Merced River overflows enough to flood the meadows, but not the roads. You get some great photo opportunities for reflections. I used to climb a lot in Yosemite, back in my days as a life-risking thrill-seeker. I would drive up late Friday night and sleep on a ground cover and sleeping pad, and in a bag at one of the campgrounds, then get up real early and drive to my intended route. What a joy to climb up one of those cliffs right at daybreak above the tree top level to gaze out over the valley with Yosemite or Bridalveil Falls on the opposite side of the valley. Early morning mist would still be hanging right over the trees in some areas, the smell of campfires and breakfast on the wind. And nature at its finest. I also extend some of my Yosemite trips to a long day of driving. I go through the valley loop, but skip the hike to Vernal Falls. I drive back out and up to Crane Flat gas station where 120 goes up through Tuolumne Meadows and over Tioga Pass. I fill up at that station (expensive) and start the drive up the mountain. Incredible views are everywhere, raging little creeks and waterfalls all along the way. Alpine lakes, newly hatching dragonflies, crested blue jays, it is all so beautiful. Then you get to the domes and Lake Tenaya. There is a vista point as you come around a left curve - be sure to stop there for the best panorama. After you pass by the lake and drive through the domes, you'll come up to Tioga Pass. There is a park entrance/exit up there and right before it on the right is a small parking lot by a lake. Great place for lunch, which is perfect because if you got to the park that morning at 8 and did the normal photo stops without any extended hiking, you'll be at the pass around 12-1 PM. After your lunch and some photos, you head out the park and down the east side of the Sierras to Mono Lake, where obviously, you take more pictures. Then it is up Hwy 395 along the eastern base of the mountain range - quite spectacular with the mountains rising straight up almost, very different from the west side which gradually builds up through the foothills first. Anyway, you come to Hwy 108 and turn left. Sonora Pass is actually one of my favorite Sierra passes. It is more scenic than Tioga Pass, I think. And there is Leavitt Falls to see as you drive up the eastern side. You have to see the vista point sign for it though. You can't see it from the road. Worth seeing. I finish the drive with a few more stops especially at the pass and then on down past Sonora to end up on the same road as a I came out before turning off to go to Yosemite. I am back home in 14 hours. Plan on more than that if you obey the speed limit.